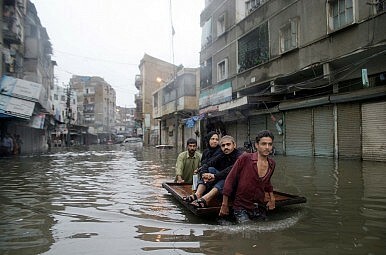 A family travels through the flooded streets of Karachi in 2011. Pakistan will face devastating effects from climate change, but it has yet to take steps to prepare. While Pakistan is already struggling with a potential existential threat—the scourge of terrorism—it’s currently siting on an even bigger ticking time bomb. Ahead of the United Nations Climate Change Conference in Paris in December 2015, the Pew Research Center conducted a survey measuring perceptions of different international issues (such as global climate change, global economic instability, and Islamic State). In Pakistan, only 25 percent of respondents said they were “very concerned” about the threats posed by global climate change. For a comparison, in neighboring India, 73 percent reported being “very concerned” about climate change. Yet research from the Notre Dame Global Adaptation Index, or ND-GAIN, categorizes Pakistan as “very vulnerable to climate change and ill-prepared to deal with its impact.” And a recent analysis in Foreign Policy argued that climate change posed an even bigger threat to Pakistan than terrorism. It is pertinent to probe into what the looming threat of global climate change has in store for Pakistan. How vulnerable is Pakistan vulnerable and—most importantly—how ready is it?. As per LEAD Pakistan, an environmental and development organization, climate change will bring Pakistan multifarious challenges. The melting of glaciers is feeding into frequent floods, putting the coastal areas at high risk, while the availability of fresh water is projected to decrease over the long term due to the same melting glaciers. Climate change could also lead to an enormous decrease in crop yields, affecting Pakistan’s agriculture-dependent economy. Diseases primarily associated with floods and droughts are expected to rise and ultimately the displacement of people and migration patterns will take a heavy toll on Pakistan in many ways. Pakistan is already suffering. More than 60 lives were claimed recently by what was termed an “unusual weather system” in northern Pakistan—heavy rain causing flash floods and landslides. According to the Pakistan Economic Survey, Pakistan lost a total of 3,072 lives and $16 billion to the floods in 2010, 2011, and 2012; as a result, the country’s economic growth has been severely affected. What harsh climatic conditions have done in many areas of Sindh province is already a story of despair. And who can forget the lethal heat wave in Karachi last year, which claimed over 1,200 lives? This year again, warnings have been issued as the temperature is likely to reach 40 degree Celsius. The United Nations predicts Pakistan’s population will surge past 300 million people by 2050. Now read that together with a projected shortage of food, massive flash floods, tropical diseases, and unbearable rise in temperature. This is a huge calamity in waiting—and it is not very far away. Meanwhile, let’s also not forget the heavy toll climate change has taken on the ecosystems, including marine and fresh water habitats. Wildlife is under threat as well. As public opinion data reinforces, it is essential that Pakistan start a public discourse on the issue in order to spread awareness first. Then concrete measures should be taken in order to better equip the country for disaster prevention, preparedness, and management. The building of new dams, barrages, and reservoirs in order to store excess water is very important. Pakistan receives around 144 million acre feet (MAF) of water from different sources, but its storage capacity is only 12.6 MAF. Tree planting and introduction of flood-resilient crops are two more areas where there is a lot of work to do. Yet Pakistan does not seem to care about climate change at all, which is more problematic than everything else. A public discourse on climate change, its hazards, and the measures to be taken has not even started in Pakistan as yet. Steps to cope with climate change will only follow afterwards. Many in the country have yet to establish if climate change is real and, most importantly, if it is caused by humans. And far from being ready to tackle the imminent dangers of climate change, Pakistan has yet to diagnose the problem and prioritize it in her national agenda. There is a lot of catching up to do and time is growing short. Mahboob Mohsin is a political science graduate from Lahore University of Management Sciences, Pakistan. He currently works as a research analyst at the country head office of Channel 24 News in Lahore. Pakistan needs access to global climate funds to combat climate change impacts.